I don't know how it is everywhere, but here (in my experience) most "chareidim" consider a rainbow to be a terrible thing – a bad omen. In short, if you were to mention that there's a rainbow in the sky, they may run of into traffic to avoid it. Now, I understand that this is because of the passuk and statements made by Chazal saying that the rainbow is a sign that Hashem won't destroy the world, and that if the world wasn't in danger of being destroyed we wouldn't see it – making it a sign that we're all lucky to be alive – but still, I think this is misinterpreted. "I have set My rainbow in the cloud, and it shall be for a token of a covenant between Me and the earth. And it shall come to pass, when I bring clouds over the earth, and the bow is seen in the cloud, that I will remember My covenant, which is between Me and you and every living creature of all flesh; and the waters shall no more become a flood to destroy all flesh. And the bow shall be in the cloud; and I will look upon it, that I may remember the everlasting covenant between G-d and every living creature of all flesh that is upon the earth.' And G-d said unto Noah: 'This is the token of the covenant which I have established between Me and all flesh that is upon the earth." And Chazal speak of certain generations in which the rainbow did not appear due to their righteousness, such as the statement that in the generation of R' Shimon Bar Yochai the rainbow was not seen because the world was protected from destruction in his merit alone, and no restraint was necessary on G-d's part. 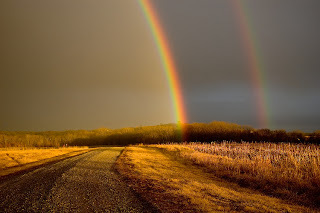 Furthermore, although there is a brocha that is said when seeing a rainbow, Chazal caution us not to gaze lingeringly at it, and as a result, people have come to translate a rainbow into a bad and scary thing. But I really think something is wrong here: A rainbow is an awesome breathtaking wonder (even in Pirkei Avos 5:9 we are told that the rainbow was created bein hashmoshos, when a number of wondrous things were created), it's a universally recognized indisputable thing of beauty and amazement! Moreover it is commonly used as a universal sign of peace – so, what's the deal? About 5-6 years ago, I was sitting in shul, and I had R' Dovid Sears's "Vision of Eden" next to me. As it happens, it has a rainbow on the cover, and the fellow sitting next to me mentioned that he was surprised that R' Sears dared to do such a thing, and I asked: "Why?" "Well," he replied, "most people around here think of rainbows as bad, yet on the cover of this book it is used as a part of a Messianic utopian image. It's just surprising." So I mentioned that I don't know what the publisher's intentions were, but the fellow cut me off and said, "No! You're misunderstanding me, I love it! It's a breath of fresh air to see someone who can recognize a thing of beauty – that's what's missing in this community!!" I agreed. I also mentioned that I, too, found this common sentiment odd, especially since in the Machzor for Yom Kippur, when describing the Kohen Gadol exiting the Kodesh Hakodoshim, the phrase "radiant like a rainbow" is used – in the piyut "Maareh Kohen": "K'dmus hakeshes besoch he'anan, Mareh Kohen (Like the image of the rainbow amid the clouds, so was the appearance of the Kohen Gadol)." It would seem odd to use imagery with negative connotations – obviously, the rainbow was not viewed in an exclusively negative light. 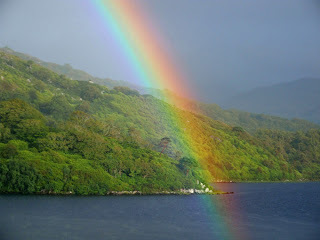 "As the appearance of the rainbow in the clouds on a day of rain, so was the appearance of the brightness round about. This was the appearance of the likeness of the glory of Hashem. And when I saw it, I fell upon my face, and I heard a voice of One that spoke." In this context, the rainbow is decidedly positive – an element of the manifestation of G-dliness. A Rainbow is awesome. Every child recognizes this. It's not up for debate. It has been incorporated into our reality as a sign of G-d's presence and involvement in this world, which would seem to explain the confusion: We are advised not to gaze at it lingeringly – because in a way it resembles G-dliness, or is at least symbolic of G-dliness, and as such we avoid staring at it for long periods of time. And as such, it has both a negative and positive connotation, since G-d has both a midda of din (severity) and chesed (kindness) – we may view the din as negative and chesed as positive, but in truth all is positive and it is only our perspective that considers the negativity of gevura. So, let's not get freaked out by the din element that may be a part of the symbol of the rainbow and let's long of the day when all we see is the beauty of the rainbow! At the very least, let's recognize its beauty, and realize that when we see a rainbow, it should be a reminder that Hashem isn't out to lunch, and it's a glimpse of what a vision of G-dliness would resemble. I think it's more of a pre-historic image than a futuristic one, but does anyone know what Rabbi Sears’s intent was regarding the rainbow (if any)? That's an interesting question. Was the rainbow first created for Noach, and therefore we should understand that there were no rainbows in Gan Eden, or was Noach merely given the new significance or meaning of the rainbow? Am Haaretz that I am, I was unaware that Chazal thought of a rainbow as a negative sign, I always naively thought it was a happy sign, a wonderful promise, a promise of steadfastness and compassion, and it is of course very often in quotidian terms a sign that the storm has abated. Miforshim discuss various approaches to your question, but the Ramban's (well stated in the link above) is the most common approach that I've heard. As to what Chazal thought of the rainbow, that is exactly my point! I also do NOT think they considered the rainbow as negative; rather, I think that this is a (common) incorrect interpretation based on the statement of Chazal not to gaze at it lingeringly. And while I can understand how this developed, I maintain that it is completely counterintuitive to understand Chazal as being rainbow-phobic (as I discussed in the post). Rainbow is a symbol of Skhine, as well as the Moon. That's the reason not to stare at them (it is can be harmful to gaze at Skhine straight). But chas vechalilo to say that it is negative, on the contrary, it is positive, but symbolizes something extremely potent, that we can't comprehend straightforwardly. Exactly! Do you find that people you meet have a negative perception of the rainbow? I didn't pay attention really, but I think not. The keshes itself isn't negative, while it appearance is connected with something negative, but it itself shows that the positive is perpetuated - i.e. the mabul is NOT coming, etc. Thank you for your patient instruction. I think I understand better now. It seems that Chazal warn against a lingering, longing gaze at the rainbow because it is so powerfully positive and wonderful, not because it was in any way a negative sign or portent. Ramban in discussing parshas Noah cites Chagigah 16a:from the schottenstein ed. Someone who gazes at a rainbow impinges on the honor of G-d, as it is written: Like the appearance of a rainbow that would be in a cloud on a rainy day, so was the appearance of the likeness of the glory of Hashem. And you already know the saying of the rabbis concerning one who gazes at the rainbow: "Whosoever takes no thought for the honor of his Maker would have been better off had he not come into the world." And if you will be worthy to understand the words of the Rabbis, you will know that the explanation of the verse is as follows: My bow - (kashti shares a common root with the word kasheh (hard, stern))- which is symbolic of the attribute of justice, set in the cloud, shall be at the time of judgment for a token of the covenant. And it shall come to pass when I bring clouds over the earth- meaning that G-d will not make His countenance shine upon the earth on account of the sins of its inhabitants- "My attribute of justice will be seen in the cloud, and I will remember the covenant in a remembrance of mercy, and I will have compassion on the little ones that are on the earth." I don't understand this discussion. would you be proud of such a court case would you tell the whole world about this big success?